Gary Cooper’s 1935 Duesenberg SSJ and a 1966 Ferrari 275 GTB/C are the leading cars for the Gooding Pebble Beach 2018 auction during Monterey Week. Although Gary Coopere’s 1935 Duesenberg SSJ is the star car for the Gooding Pebble Beach 2018 classic car auctions during Monterey Week in California, USA, several classic racing Ferraris are also expected to sell for multimillion dollar prices. 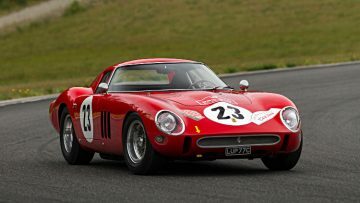 The 1966 Ferrari 275 GTB/C is likely to attract the highest bids but the classic 1958 Ferrari 250 GT Tour de France Berlinetta, 1950 Ferrari 166 MM / 195 S Le Mans and 1955 Ferrari 500 Mondial Series II remain highly desirable cars. Several special Porsches, Maseratis and Bugattis are also likely to achieve multimillion-dollar results. 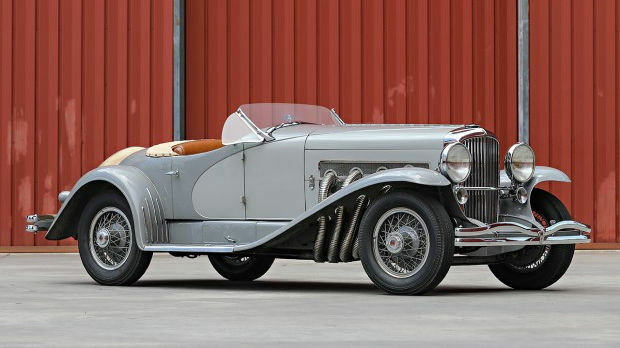 The headline car for the Gooding Pebble Beach 2018 sale is the 1935 Duesenberg SSJ originally delivered to Gary Cooper. No presale estimate has been released but at the original announcement “in excess of $10 million” was mentioned. The current marque record is $10,340,000 achieved for a 1931 Duesenberg Model J Long-Wheelbase Coupe at the Gooding Pebble Beach 2011 sale. 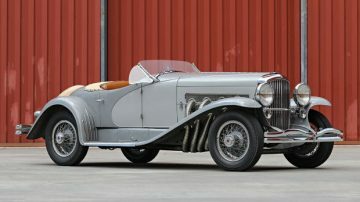 The 1935 Duesenberg SSJ, chassis J-563, is one of only two Duesenberg SSJ models ever built, and was constructed on a specially shortened 125-inch wheelbase. It was originally delivered to Gary Cooper while chassis J-564 went to Clark Gabe in a planned publicity stunt that seemed to have had limited success. No photo of the two stars with an SSJ survived and Duesenberg shortly afterwards went out of business too. The car had various subsequent owners but since 1949 only two: famed racing driver Briggs Swift Cunningham and equally famous car collector Miles Collier. The Duesenberg is highly original, as could be expected for such a car that spent most of its life on display and with only 20,000 miles on the clock. The 1966 Ferrari 275 GTB/C, chassis 09063, estimate $12,000,000 to $14,000,000, is the car with the highest presale estimate in the Gooding Pebble Beach 2018 sale. The 1966 Ferrari 275 GTB/C is one of 12 competition cars built by Ferrari for the 1966 season. It was originally owned and raced by Mexican racing driver Pedro Rodriguez but subsequently belonged to Luigi Chinetti Motors that entered it into the 24 Hours of Daytona as a NART entry in 1967 and 1970 but if failed to finish on both occasions. The Ferrari was restored in the 1990s and is a matching numbers example. It has not been exhibited since 2005. 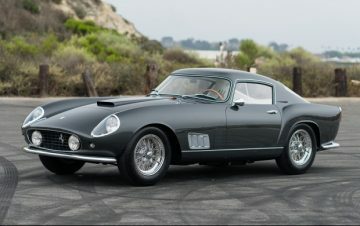 The 1958 Ferrari 250 GT Tour de France Berlinetta, chassis 0905 GT, estimate $6,500,000 to $7,500,000, was the fifth of 36 single-louver examples built. It is presented in its original stunning dark grey metallic livery. The car had a limited in-period racing history including a DNF at the Targa Glorio and a third in class at the Trieste-Opicina Hillclimb in 1958. Since 1966, Fred Peters owned this Tour de France. He frequently exhibited the car and had it completely returned to its factory appearance in 2014. The 1950 Ferrari 166 MM / 195 S Berlinetta Le Mans, chassis 0060 M, estimate $6,500,000 to $7,500,000, is one of just six touring berlinettas built on the 166 MM chassis. The Berlinetta was the display car at the Paris Salon in 1950 before Brigg Cunningham took ownership. He had the car upgraded to 195 S specification before racing it with success in the America for three years. The Ferrari was last exhibited at Pebble Beach in 2001 when it won Second in Class. 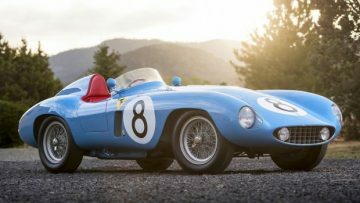 The 1955 Ferrari 500 Mondial Series II, chassis 0556 (0446) MD, estimate $5,500,000 to $7,500,000, had a successful in-period racing history both by privateers and as a works entry. It famously finished the inaugural Venezuela Grand Prix in 1955 first in class (and fifth overall) as an official Ferrari entry when still painted French racing blue. The Ferrari 500 Mondial belonged to Rear Admiral Robert Philips since 1960. It was successfully exhibited at many events in the USA, including a first in class at Pebble Beach in 2008. The 1967 Ferrari 330 GTC Speciale, chassis 9653, estimate $3,300,000 to $3,800,000, is one of four GTC Speciales built and amongst the final coachbuilt Ferraris. It was a Pininfarina show car at the Geneva Auto Salon in 1967. The car was restored in the 1990s and has not been exhibited in the past 20 years. The 2014 Ferrari LaFerrari, estimate $3,200,000 to $3,600,000, is a single-owner, US-specification car with only 1,050 miles on the clock. The car is finished in triple black: black exterior, black interior and black seats. 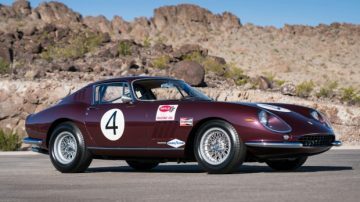 It is one of four LaFerraris on offer at the various Monterey Week 2018 auctions. 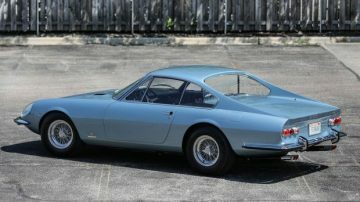 The 1966 Ferrari Dino Berlinetta GT, estimate $2,000,000 to $3,000,000, was the second Ferrari Dino prototype built by Pininfarina. 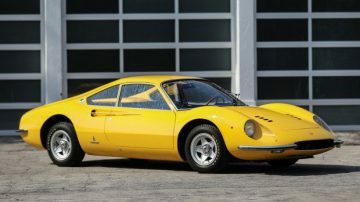 It was displayed at the Ferrari stand at the 1966 Torino Motor Show and played an important role in the development of the Dino 206 and 246GT. In contrast to the first Dino Berlinettta Speciale Prototype that was sold for $4,650,000 by Artcurial in Paris 2017, this prototype is a running and fully operational car. 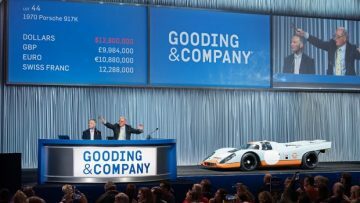 Gooding has a good reputation for selling top Porsches at Pebble Beach, including both Porsche cars that sold for over $10 million dollar: the Le Mans-winning 1982 Porsche 956 in 2015 and the marque-record 1970 Porsche 917K used during the filming of the Steve McQueen movie Le Mans. 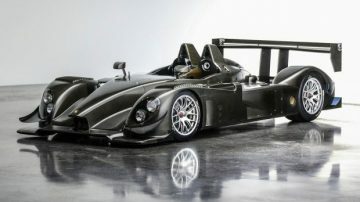 The 2007 Porsche RS Spyder is offered without a presale estimate largely as this is the first of its kind ever offered at public auction – a marque record is unlikely. The car on offer was the last of six built for the 2007 season with around 15 produced in total of one of the most successful prototype racing cars in Porsches illustrious racing history. However, it was not raced in period and only sparingly at historic races. 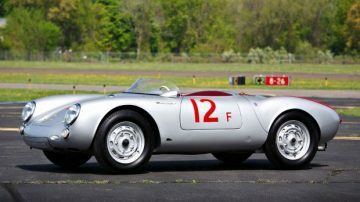 The 1955 Porsche 550 Spyder, chassis 500-0053, estimate $4,000,000 to $5,000,000, was successfully campaigned in period by privateer racer Eldon Beagle. It is a matching numbers car in good mechanical condition. After Bonhams sold a Porsche 550A for a model record $5,170,000 at Scottsdale 2018, more came to auction. Mecum and RM Sotheby’s will both offer a 550A at the Monterey 2018 auctions. The model record for a 550 was set at Gooding Amelia Island 2016 when Jerry Seinfeld’s 1955 Porsche 550 Spyder sold for $5,335,000. 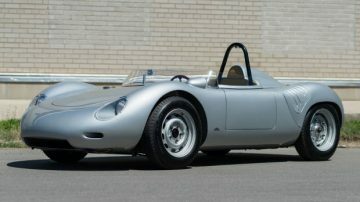 The 1959 Porsche 718 RSK, chassis 718-024, estimate $3,600,000 to $4,100,000, is one of only 34 built. It was sold new to American racing driver Ed Hugus who raced the car until 1963, including a DNF at Le Mans in 1959. The Porsche has not been displayed for two decades and has never before been offered at auction. The 1966 Porsche 911 Spyder, estimate $700,000 to $1,000,000, is a bit of a dark horse. It was produced by Bertone for influential car dealer John von Neumann in the hope that Porsche would produce it. The Spyder was shown at the 1966 Geneva Auto Show but Porsche ultimately preferred to produce the Targa that closely resemble the familiar 911 lines. 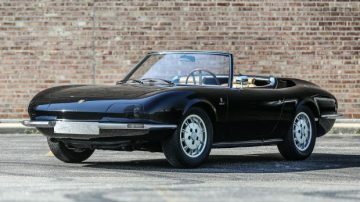 This unique 911 Spyder would remain the only collaboration ever between Porsche and Bertone. The 1931 Bugatti Type 51 Grand Prix was an original Bugatti Works racing car. It comes with a comprehensive in-period racing history and retained its original bodywork. The 1938 Bugatti Type 57C Atalante is a late production model in very original condition including its original engine and rare alloy coachwork. The 2010 Bugatti Veyron 16.4 Grand Sport is one of only 150 built. It had two owners and only 9,000 miles on the clock. The 2014 Bugatti Veyron Grand Sport Vitesse is as new with only 400 miles on the clock. 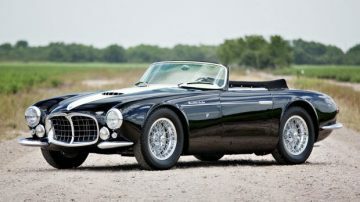 The 1955 Maserati A6GCS/53 Spyder is one of only three spiders built by Frua. It was displayed widely in the 1960s but more recently only at the Concorso d’Eleganza Villa d’Este where it won Best in Class in 2010. 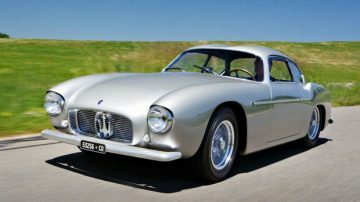 The 1956 Maserati A6G/54 Berlinetta is one of only 20 with lightweight alloy Berlinetta bodywork by Zagato. 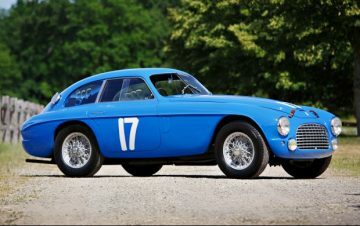 After being raced at the 1956 Mille Miglia, 1957 Trieste-Opicina Hillclimb and other period races, 2155 was re-bodied by Zagato in 1958 as a unique design study for the new 3500 GT model. The 1966 Ford GT40 Mk I was originally used by Shelby America for promotional purposes. It thus includes a very rare set of factory luggage boxes. The 1967 Ford GT40 Mk IV is one of only 12 produced. It was extensively raced, but mostly DNF, in the Can-Am Competition by Peter Revson, Jack Brabham and George Follmer. The 1908 American Underslung 50 HP Roadster, estimate $1,200,000 to $1,400,000, is the only pre-Frist World War car on offer at the auctions during Monterey Week 2018 with a lower estimate exceeding a million dollar. 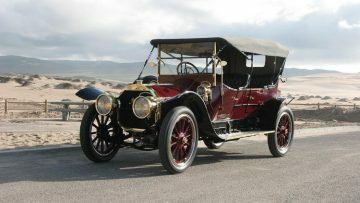 The automobile retained its original body and the 50 HP engine is still capable of propelling the vehicle to over 60 mph.